Gilbert Perez campaigns outside a polling place during the special election for Hidalgo City Council Place 5 at Hidalgo City Hall on Saturday, October 28, 2017, in Hidalgo. HIDALGO — Mail-in ballots once again played a role in the election here, and after the previous race was tainted with voter fraud, one organization wants to make sure candidates and their supporters followed the law. Mildred Escobedo, an Hidalgo resident and former campaign manager for candidates there, created a new organization dubbed Election Integrity Advocates. The organization — recently registered with Hidalgo County Clerk Arturo Guajardo Jr. — has been raising issues that have long been talked about in the community, including voter fraud. A state district judge ruled that last year’s runoff election between Council member Oziel Treviño and his opponent Gilbert Perez was tainted by fraud. District Judge Don Wittig found Treviño received illegal votes through mail-in ballots and ordered a new election between both candidates. 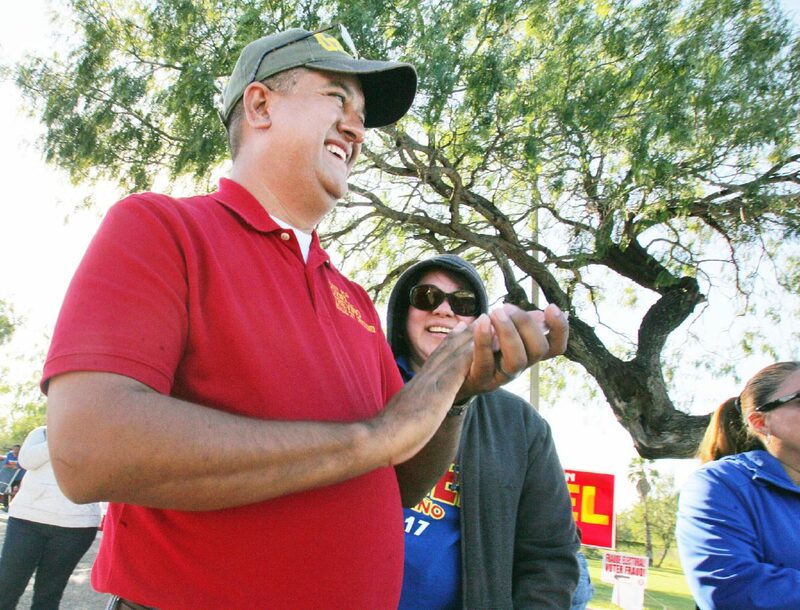 Oziel Treviño campaigns outside a polling place during the special election for Hidalgo City Council Place 5 at Hidalgo City Hall on October 28, 2017, in Hidalgo. During the trial, however, much of the testimony focused on Treviño’s biggest allies: Hidalgo Council member Rudy Franz and his politiqueras, who routinely picked up and mailed absentee ballots. The December 2016 finding from Wittig left Escobedo with a bad taste in her mouth, and she vowed Monday to take a closer look at Saturday’s election redo between Treviño and Perez. “We’re doing the investigation, and we’ve been working since this morning,” she said Monday. 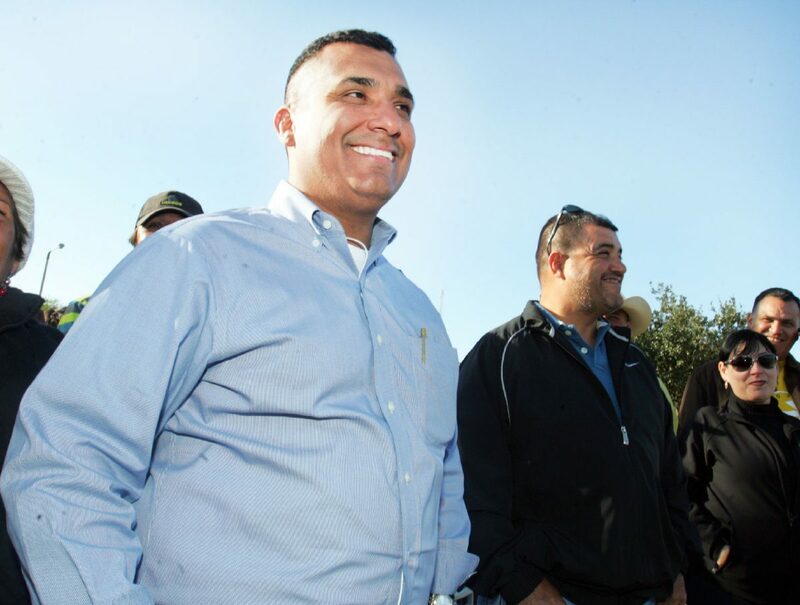 Escobedo felt the need to look into the matter after she realized Treviño had once again received a high number of votes from mail-in ballots compared to Treviño. According to unofficial figures from Hidalgo County Elections Department, Treviño received 106 absentee ballots in his favor, while Perez only received eight. During last year’s runoff, Treviño received 165, while Perez received 25. Treviño recently dispelled any notion that he once again received illegal votes, as did Franz. “I will tell you one thing, everything was done by the book,” Franz said. Perez, who filed the lawsuit after he lost by six votes to Treviño, did not respond to a call for comment Tuesday. Escobedo said she has spoken to Gov. Greg Abbott about the situation in Hidalgo, as well as Hidalgo County District Attorney Ricardo Rodriguez. She has shown Rodriguez what she believes is evidence in the form of video footage, but said she hasn’t heard back from the DA’s office. Rodriguez did not respond to a request for comment Tuesday.